Content: Need a smartphone accessory? Not enough memory on your phone? Goo’s high-capacity flash drive gives you 32 or 64GB storage capacity, comes in a silver or gold-coloured version, and lets you transfer all types of files from your smartphone including html, jpeg, png, doc, txt, mp4, and aac. Ultra-compact (47 grammes), this flash drive is compatible with phones running iOS 7 or later. It can therefore be connected to an iPad or an iPhone. 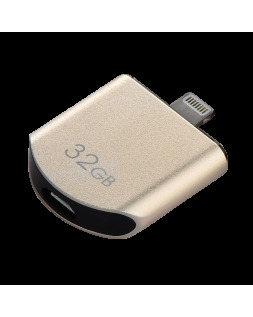 Used with the Powerdrive app for managing your files, this portable accessory increases your smartphone's memory and operating speed. The perfect accessory for enjoying an evening at a sporting event with friends without losing a second of the action. This high-capacity flash drive for iPhone and iPad slips easily into the pocket of a laptop bag, and benefits from an excellent write speed, even for large file transfer.